Subrosa Warhead, Warhead XL, and Combat locks are in stock now and ready to protect your bike! 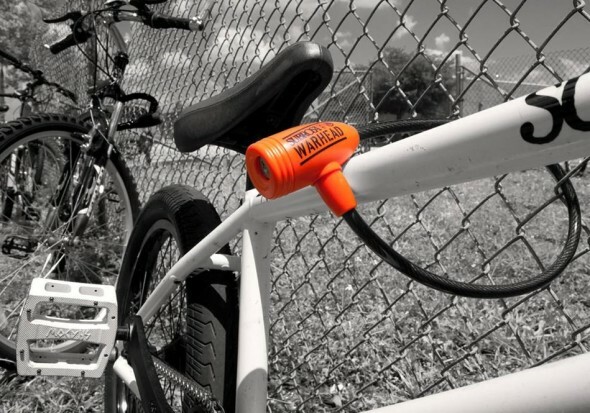 Subrosa Warhead locks are a great way to keep your bike safe when you’re out and about! Click HERE for complete spec info and to check out all of the Subrosa locks we have in stock! Key entry (includes 2 keys). High impact ABS composite cover over steel locking mechanism. 10mm thick, stainless steel braided cable with a plastic cover. Although this lock offers a greater level of security, it’s not recommended for long term or overnight locking, but works great on a bike rack, a quick stop for some eats, or just hanging out. « Shadow Conspiracy Super Slim Knee Pads, Elbow Pads, and Shinners Shin Guards in stock now!